Property owners in Dallas, NC can get same day help recovering from water damage by contacting 911 Restoration of Charlotte. Our water damage restoration experts are on call 24/7/365 and they can reach your property within 45 minutes of an emergency call. The pros at 911 Restoration of Charlotte are also IICRC certified to take care of mold removal after you experience water damage. We can check your property with a mold inspection to determine your exact mold remediation needs. Let us handle mold decontamination and all other aspects of water damage restoration. You can call us right now to get the help you need to return your property to better-than-new condition. How Do the Professionals Handle Flood Cleanup? Storms, floods, and plumbing disasters can dump a tremendous amount of water into homes and businesses in Dallas. You deserve professional help recovering from these emergencies. 911 Restoration of Charlotte can use cutting edge equipment to remove water from your property. 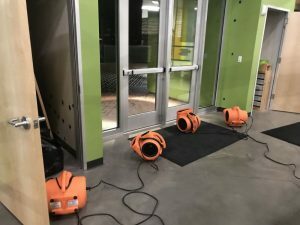 Our water damage restoration techs also utilize air blowers and fans to totally dry and dehumidify your property. We can offer you a mold inspection to ensure you aren’t at risk for a mold infestation after a pipe burst or a flood. Mold removal is very important in our area. Mold can impact our health and destroy your property, so let us focus on mold remediation and mold decontamination if you suspect you have a fungal infestation in your home or business. Getting professional help on your side right away can limit the total costs for restoring your property. Get a Fresh Start in Dallas by contacting a crew of licensed, bonded, and insured property restoration techs today. 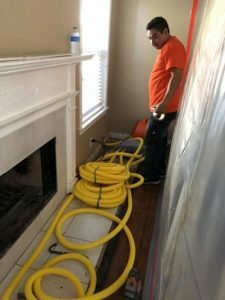 Who Do You Call for Mold Removal Services in Dallas? Mold can cause serious problems for property owners in Dallas. You might discover mold growing in your property after a flood or a pipe burst emergency. Getting immediate help with flood cleanup can lower the odds that you’ll face a mold infestation. If you suspect you have a mold issue, you can contact the mold remediation techs at 911 Restoration of Charlotte today. Get the information you need about your situation with a mold inspection. We can take care of mold removal while we handle water damage restoration. Mold decontamination is an important part of mold remediation. It can ensure that your property is properly disinfected and that any odors associated with mold growth are removed. Let us handle all of your property restoration needs so your property can be returned to better-than-new condition. Servicing the cities of Albemarle, Belmont, Cabarrus County, Catawba, Charlotte, Claremont, Cleveland, Concord, Cornelius, Cramerton, Davidson, Denver, Gastonia, Harrisburg, Huntersville, Mount Holley, Iredell County, Kannapolis, Newell, Lowell, Dallas, Rockwell, Stanley, Mooresville, Mount Ulla, Westport, Troutman, Statesville, Paw Creek… and surrounding areas.